17/01/2017: After only a few hours of rest (New York is definitely the city that never sleeps!) we were up bright and early to hit the Chelsea Markets for some breakfast before a big day of campus tours and exploring. The Chelsea Markets provided a classic New York environment for us to kick-start our first day in NYC; a hip, seemingly exclusive, underground collection of niche food vendors and shops that had everyone’s mouth watering. 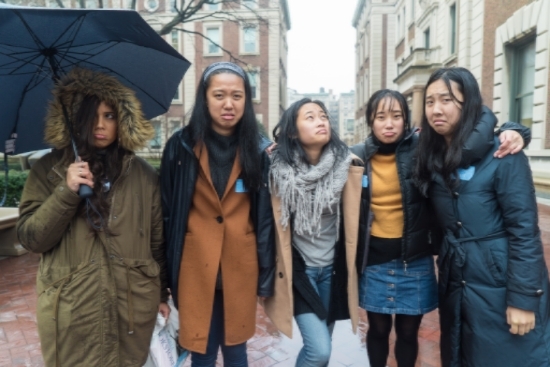 Once we’d indulged in the various breakfast cuisines, including the classic New York bagel, we headed to the Upper West Side for an information session and tour around Columbia University, one of America’s eight Ivy League institutions. Standing in the middle of Columbia, you wouldn’t know you’re in the heart of one of the world’s most fast-paced cities. It’s like an oasis lost in a metropolis; beautiful brick buildings that take your breath away completely surround you blocking out the high rise buildings and the wailing of sirens and alarms that seem to perpetually ring out across Manhattan. During the information session, we learnt about the rigorous and competitive admission process into Columbia and all the different study options for students once accepted. It proved to be an inspiring insight for all the students on the trip with big dreams of attending an Ivy League college. We were then taken around the campus and shown all the residential and study buildings, some dating back to 1905-1910. It was, unfortunately, a very wet New York day, so we walked around quite fast while listening to the tour, managing to catch most of it - the tour, not the rain, obviously. Once we finished up at Columbia we caught the subway back downtown to visit NYU, which has a completely different campus structure. The buildings are scattered throughout the streets of Manhattan only to be identified by the NYU flags hanging outside. As a student, you can imagine how inspiring it would be to have the constant creative buzz of Manhattan right outside your lecture theatre and classrooms, literally on your doorstep! 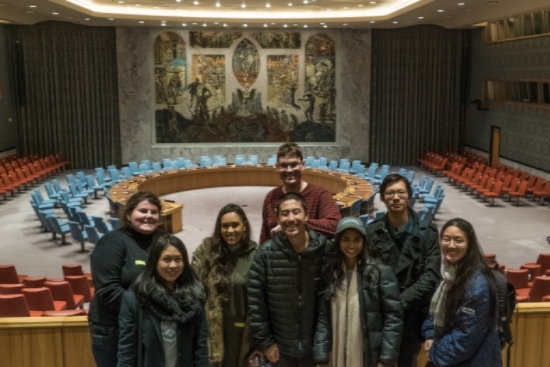 After our brief look through NYU, we split into two groups: one group who wanted to tour around the United Nations, and another who wanted to visit the Rockefeller Centre and have a shop along the world-famous Fifth Avenue. The United Nations group took a tour around the entire UN complex, even gaining access to the Generally Assembly Hall where all 193 members States of the Organization convene to discuss global issues. It felt incredible to stand in the same room where so many world leaders have been and important discussions have taken place. The other group headed to the Rockefeller Centre but, unfortunately, due to the rainy New York weather, were unable to go to the top of The Rock. the shopping group then moved onto Central Park, which looks exactly as it does in the movies and did not disappoint on beauty. After a brief stroll through Central Park we continued down to Fifth Avenue, where we saw some of the world’s biggest brands and most beautiful stores. We even stopped into a few stores such as Cartier, Apple, Tiffany and Co, and Nike, although most price tags reached far beyond our humble means. We concluded day one of our New York adventure in Times Square, where both groups reconvened and ate dinner while watching the thousands of tourists buzz around under the New York rain and through the bright lights of the neon signs above. Follow us on the Crimson Education Facebook and Instagram to see some photos of our adventures!